Kim Stanley: Daughter of Texas. She didn't have Renee Zellweger's pout, couldn't ride like Dale Evans, and never golfed like Babe Didrikson Zaharias. She couldn't sing like Janis Joplin either, and she was not really pretty like Donna Reed, but Kim Stanley was probably the greatest American actress who ever lived. Funny thing is, Kim Stanley told everyone she was a Texan, and said it so many times and so well, people believed her, even genuine Texans like Horton Foote of Wharton. Among her many starring roles was Wilma, a star-struck 15-year-old girl from the Gulf Coast of Texas in Horton Foote's A Young Lady of Property, which aired on the Philco-Goodyear Television Playhouse April 5, 1953. Onscreen in 1958's black and white movie, "The Goddess," by Paddy Chayevsky, the Marilyn-Monroesque story of an unstable small town girl who reaches the heights of fame in Hollywood, Kim Stanley gives a performance perhaps greater than any other on film, one that makes the audience shift in its seats, as though peeping through the window of someone's life. It was her first movie. Kim Stanley made very few films, and was nominated for the Oscar for nearly every one, even that of Pancho Barnes in "The Right Stuff" though she was onscreen fewer than ten minutes. She preferred stage acting, and electrified audiences with performances as Cherie in "Bus Stop," a role she created which was later played onscreen by Marilyn Monroe, starring roles in "A Touch of the Poet," and "A Far Country," and was nominated for a Tony for the latter two. When British critics criticized her 1965 London performance of Masha in Anton Chekhov's "The Three Sisters," since it was performed using method acting rather than the traditional style of acting, she vowed never to perform on stage again. And she never did. Problem was, like Marlon Brando, to whom she was so frequently compared and whose female counterpart she was considered by the acting community, Kim Stanley was self-destructive. People were in awe of her talent, when she chose to display it. What she did not share was everything else. She was secretive and complex and, as described in her long-awaited biography, "Female Brando: The Legend of Kim Stanley," by Jon Krampner, she created a shape-shifting personality. Born Patricia Beth Reid, she told different stories about her origin, depending on her mood. In the rural Texas version, she was born to a Baptist family on a farm outside of Lometa in the hill country of Texas. She was not allowed to dance, listen to the radio, or go to the movies, all considered instruments of the devil. "If Christianity covers the world like Sherwin-Williams, Baptists cover Texas like a wet blanket," writes Baptist philosopher Raymond Flynn. "As a Baptist, you can do almost anything as long as you don't enjoy it, drink it in public, do it to music, or continue it after 10 p.m."
In the urban Texas version, Kim said she grew up in San Antonio, or sometimes Dallas or other times, Houston. The third version has Kim born in Albuquerque, New Mexico to a stern father who's a professor of adult education at the University of New Mexico or, at other times, he was a professor of philosophy. "Acting was my ticket out of Texas," said a defiant Kim. Except she was born in Tularosa New Mexico. Never mind that, she was such an incredible actress that she even fooled native Texan Horton Foote who believed Kim was also a native Texan. She did graduate from the University of Texas with a degree in psychology. Her father, Jesse Taylor (J.T.) Reid, was born in 1889 on his family's ranch near Gonzales, in a fertile area of South Texas between San Antonio and Houston. The ranch was on rich bottomland along the Guadalupe River. When floods created an infestation of malaria-bearing mosquitoes, the Reids moved to higher ground. Kim's great-grandfather fought at Vickburg and Chickamauga and lost his arm during the Civil War. Often, during the remainder of his 95 years, he was known to rub his stump and mutter, "Those damn Yankees!" When J.T. was 15, the family moved to a 1400-acre ranch in Lampasas County near Chadwick's Mill several miles west of Lometa in the Texas hill country. His dad, "Big Red," used to tell his sons, "I'm not raising my boys to be soda-jerking sissies or mama boys. They are he-Texans, aren't you, fellers?" Kim's maternal grandfather, Milton Miller, farmed and ranched in the Atherton community a few miles east of Lometa. He was a former school teacher and a dedicated Baptist who lost an eye to a mesquite thorn. He married the former Sarah Ann Stanley, a friend of Nancy Hanks, Abe Lincoln's mother, who had a few non-Baptist habits such as dipping snuff and taking cocaine. Of their seven children, Kim's mother, Rubyann, was known to have "a streak of the rebel and the dreamer in her." J.T. Reid met Rybyann Miller in Brownwood, Texas, at Howard Payne, though some say they met in a church in Lometa and others swear they met at a revival meeting while J.T. played guitar. The couple married and, after living in Goldthwaite and Rusk, Texas, eventually relocated to New Mexico where J.T. became superintendent of schools in Tularosa, and where Kim was born. He announced at his first teachers' meeting, "You have been chosen because you are well-qualified. The janitor will provide a paddle, God has provided a place for its use. Put the fear of God in their hearts and teach them something." The one thing J.T. failed to understand was girls. "He couldn't have understood Kim if they put a gun to his head," says a relative. He pooh-poohed acting. Kim later said, "My father always thought acing was very silly and I wanted his approval... I think he still regards fishing as more important." It was later said by her colleagues that Kim's conflicts with her father created the climate of personal chaos which produced great emotional scenes on the stage. Kim spent a lifetime creating new rejections to control and use on stage. Kim's tortured relationship with her father brought trouble in her relations with all men. She married four times and had countless affairs, including one with the brother of Montgomery Clift, while married to another man, which produced a child. When Kim was eight years old, Rubyann divorced J.T. on grounds of adultery, after 18 years of marriage, and fluttered from one man to another and eventually returned to Texas. It was in at the Texas Theater in San Antonio in 1940 that young Kim had an epiphany. She saw Katharine Hepburn onstage in "The Philadelphia Story," on a national tour after the film's release. "I was overcome. I was transfixed," Kim later said. "The impact of Katharine Hepburn's personality was fantastic.... I wanted it to go on all night." San Antonio didn't work for Rubyann, nor did Houston or Galveston, so she returned with her children to Albuquerque, always called by Kim, "Dad City." Of Kim, Pulitzer prize-winning playwright Paul Zindel said "The secret lies with the father. It's also the secret to her anger, her disappointment in life. It's the secret to her power. When you explore it, I think you're going to find that she could never please her father, that more than anything she wanted to be her father. This was the power that hung over her and made her demons all focus and go wild and come out. 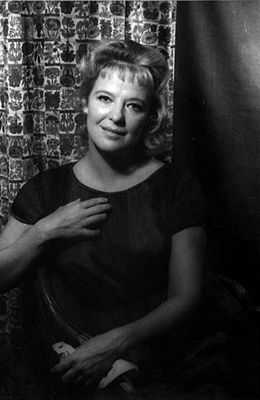 I think it was the secret of her talent and what made Kim Stanley what she was." Kim was "tossed back and forth between the parents," according to Jon Krampner's bio of her, and early warning signs of her later drinking problem appeared as early as her sorority days at UNM. Kim was also head and shoulders above every other drama student at UNM. Kim later told Lillian Ross of the New Yorker "Although I really did feel something about this girl I played [in a UNM production], I wasn't thinking seriously about an acting career." It was while at UNM that Kim was discovered by director John Kerr, who encouraged her to come to the Pasadena Playhouse. She left the University, and followed Kerr to California. The Pasadena Playhouse's alumni eventually included Horton Foote, Dustin Hoffman, Gene Hackman, Lee J. Cobb, Frances Farmer (whose smothering, controlling mother Kim would play in 1982's "Frances" for which she was nominated for an Oscar), and James Arness. In early 1946, Kim left the Pasadena Playhouse and went to Louisville Kentucky to work in winter stock at the National Theater. It was here that she changed her name from Patty Reid to Kim Stanley. After the troupe broke up, Kim boarded a Greyhound Bus headed for Broadway. She had $21.00 in her pocket. "Making the rounds is like trying to sell yourself, as if you were something on the hoof," she later said. "I would get paralyzed, once in an office, and would be unable to remember the name of the play I was trying to get a job in. I hated the whole procedure. it was humiliating. They'd ask me what I had done on Broadway, and I couldn't speak. Emotionally, I couldn't take it. My hands would start sweating. I would feel like a cipher. Nothing was worth that." Driven and intense, she began to get parts in summer stock. She once was fired because, according to the producer, "When this girl did not show up for rehearsals, I asked her why and she said, "I don't feel like working this week." Kim supported herself by modeling in the fashion house of Herbert Sondheim, whose son, Stephen, would later become a theater legend in his own right. Details of her life appear to be quite hazy at this time as to where and with whom she lived, whether or not she actually toured Southern towns modeling dresses, as she told Lillian Ross of the New Yorker, and it appears she was married. She was still drinking too much, worrying her friends and her mother, who sometimes lived with her, and who suffered a breakdown sending her back to Texas. Kim joined the Interplayers, a semi-professional theater group, where she sold lemonade and cleaned out the men's room. "Very embarrassing," she later recalled. "Me, about to be an Eleanora Duse, yelling, 'Lemonade, Get your lemonade.'" Kim's breakthrough role came in William Inge's 1953 play, "Picnic," and she finally saw her name go above the title in Horton Foote's 1954 "The Traveling Lady." It was the first time in the history of he Playwrights Company that it had voted to elevate a performer to above-the-title status. She was also one of the first members of The Actors Studio. If anyone wants an acting lesson, just take a look at 1964's "S�ance on a Wet Afternoon" and watch the last 10 minutes of Kim Stanley's Oscar-nominated performance. Her talent was so immense that she truly deserves to be remembered proudly as she wished to be remembered -- as a daughter of Texas.